And its all about the Google's new social networking site Google + that was launched in late June had 25 million unique visitors since July 24 with growing at a rate of roughly one million visitors a day comScore recently released a first look at visitation to Google+. MySpace - less Than 2 years..! 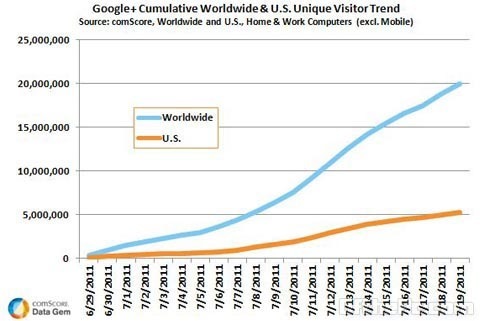 comScore analyzed how Google+ is performing to date and who is using it, based on the first 21 days of its public existence (June 29, 2011 – July 19, 2011) data concerning unique visitors - which is different than “users” in that people who never sign up may visit Google+ pages that excludes usage via mobile devices.